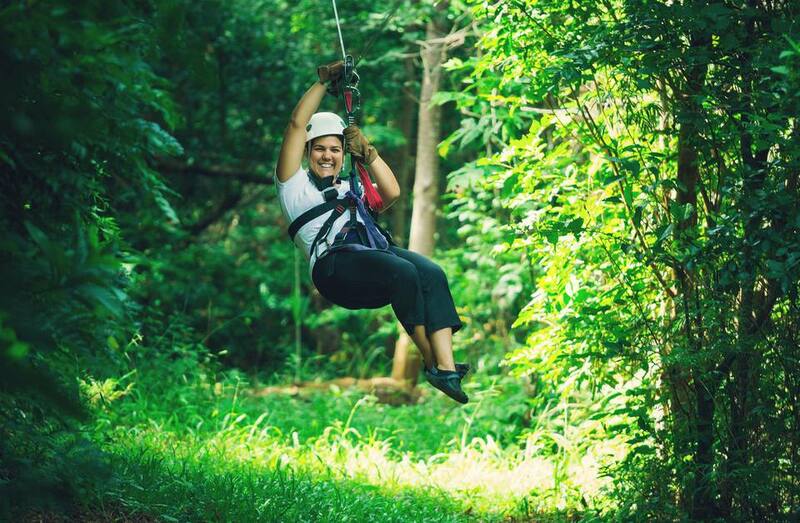 Zip Lines have been growing in popularity across the nation and are a fun way to explore your sense of adventure. Participants fly through the air, swing through the trees, and challenge themselves with obstacle courses. It’s a great outdoor activity for families, friends and groups. Following is a guide to the zip lines and ropes course near Washington DC including destinations in Maryland, Virginia and West Virginia. Locations in Rockville, MD, and Springfield and Williamsburg, VA. The course spans a length of more than seven football fields and with obstacles 40 feet above the ground including a series of zip lines, Tarzan swings, rope ladders, bridges, swings, and trapezes among the treetops. Participants are given a 30-minute safety training and then proceed through the course over a 2 to hour period. Ages 10 and up. Savage, MD. The outdoor adventure center features a zipline, ropes courses, a giant swing, climbing tower, and offers kayak tours, geo-caching, bike tours, bike rentals, river tubing, reel fishing, sailing, horseback riding, windsurfing, rock climbing, indoor climbing, and more. Activities are available year-round including team building exercises, group tours and special events. Ages 5 and up. Children under 14 years of age must be accompanied by an adult. Sandy Spring, MD. The aerial forest ropes park consists of 13 separate courses of varying difficulty level ranging from beginner to expert. Each course has zip lines but primarily consist of “bridges” between tree platforms made of rope, cable and wood configurations creating over 150 unique challenges. Ages 5 and up. Courses are restricted by age. Harpers Ferry, WV. The guided 3-hour tour includes 7 zip lines from 200 to 800 feet in length, 4 belayed tandem ladder climbs, a plank bridge, a Burma bridge and a 25 foot rappel from the final platform. The zip line site dates back to 1734 and is located at the confluence of the Shenandoah and Potomac Rivers. Ages 5 and up. Read more about visiting Harpers Ferry. Middleburg, VA. The tree top tour spans 20 acres, providing a bird’s eye view of the Virginia countryside. Open year-round to the public, the guided tours begin and end on the Grand Lawn of the resort. The canopy course is comprised of zip lines varying in length from 90 to 670 feet including five different zip lines and two suspension sky bridges. Special teambuilding programs are available. Reservations required. Read more about the Salamander Resort. Basye, VA. The four-season resort in the Blue Ridge Mountains offers 10 different zip lines over the ski chairlifts at over 80 feet off the ground. Available April through October, the guided tour takes almost 2 hours to complete and includes a ride on the chair lift to get to the top of the mountain. Ages 8 and up. McGaheysville, VA. The four-season resort, located near Shenandoah National Park, offers zip line tours at its Family Adventure Park and Peaked Mountain Express Tube Park. The tour includes a burma bridge, hanging vines crossing, and four zip lines ranging from 90 to 450 feet long. A new tour has been designed just for kids. Regular Tour – Ages 10 and up. Kids Tour – Ages 5-12.